This Discussion Guide aims to help government and public sector agencies at all levels (e.g. national, state, and local governments, municipal and regional authorities, government-funded programs) integrate accessible information and communication technologies (ICT) into their policies and practices. 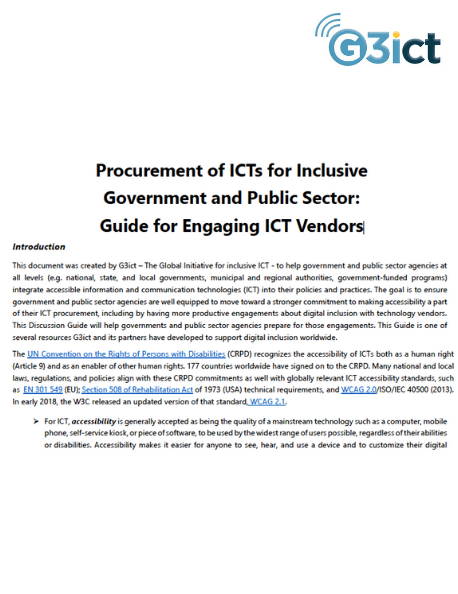 The goal is to ensure government and public sector agencies are well equipped to move toward a stronger commitment to making accessibility a part of their ICT procurement, including by having more productive engagements about digital inclusion with technology vendors. It is one of several resources G3ict and its partners have developed to support digital inclusion worldwide.